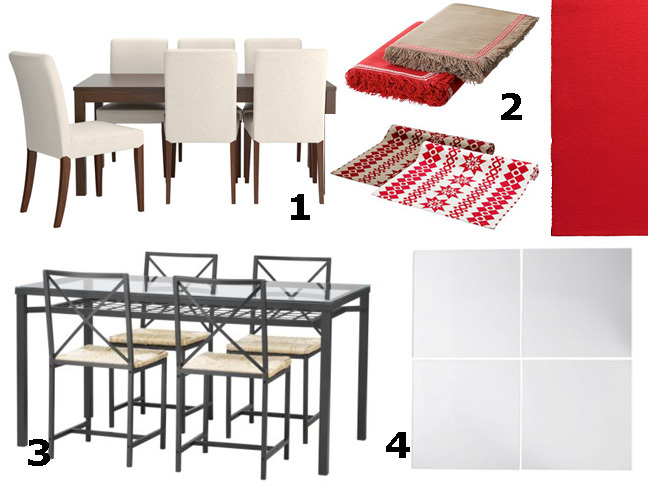 When the holidays roll around, it’s time to deck the halls — and the table. Need a bit of inspiration – just think of that warm and tingly feeling you get when your table is full of the people you love and you light the candles. It is that warm glow, smiling faces, and good food and drink that makes time stand still and all seem right in the world. Use those thoughts and memories to make the most of your holiday get-togethers by making the table a feast for the eyes. Here are a few simple ways you can make it happen effortlessly and affordably. Create nights to remember around a festive table. It doesn’t matter if it is big or small, round or square, in your kitchen or formal dining room. Celebrating the holidays is all about getting together with friends and family. Do it in style with illuminating light, colorful accents and your personality. 1. + 3. Buy festive fabric to cover your dining room chair cushions. All you need is fabric, a screwdriver to remove the seat, and a staple gun to attach the fabric. Don’t remove the existing fabric, just staple the holiday fabric over it. Once the holidays are over, you can remove the holiday fabric. 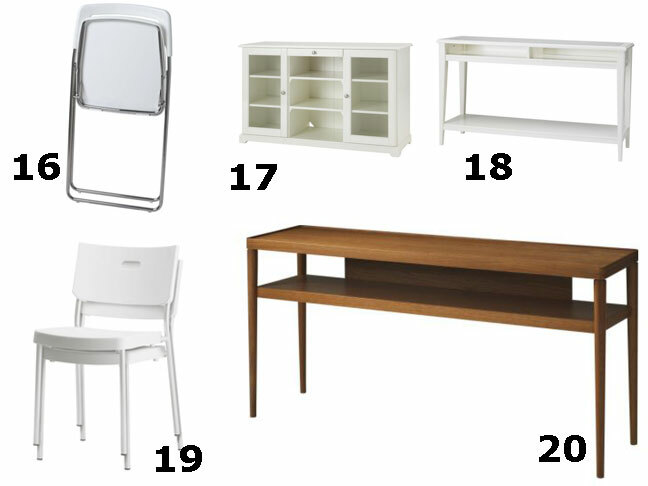 BJURSTA rectangular table and 6 chairs, GRANÅS Dining Set with 4 chairs. 2. Festive holiday motifs and colorful table linens add to the special occasion feel you want to create on your table. Layer for more interest. Use a patterned table runner on top of a solid color cloth. SNÖBOLL festive table linens. You don’t need a matching set of fine china to set a beautiful holiday table. 5. + 6. Elegant white-on-white place settings create the classic foundation for your holiday table while letting you mix and match easily no matter what the occasion, plus the food takes center stage when served on a white plate. Layer a smaller plate on top of a larger one. For a pop of color, layer a colorful ribbon vertically between the two so it drapes over the top and bottom of the larger plate. FÄRGRIK and IKEA 365 dinner plates. 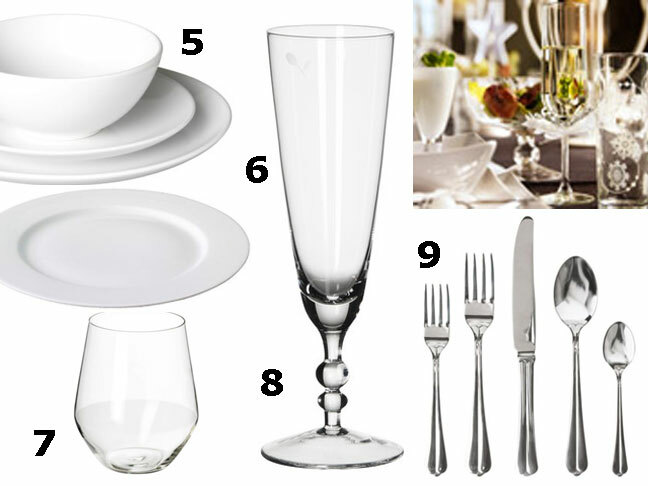 champagne flutes or stemmed glassware to each place setting. They also add a bit of shine that will make the table feel special occasion worthy. Add more interest by tying on a jingle bell with a colorful ribbon to the stemware. 9. Add some table glow with touches of metallic finishes. You will be surprised how reflected their finishes can be. SVIT flatware. The right kind of light can change the way your table setting looks and feels. The soft glow from candles and chandeliers can be adjusted to create the perfect mood. 10. Your chandelier becomes part of the table setting when you add some greenery or shimmery garland around it and hang a few ornaments from each arm. 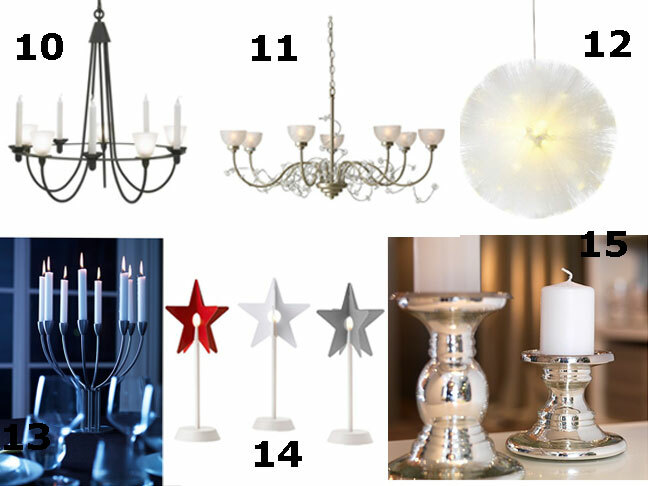 LERDAL chandelier can be used with candles, electric lights or both. 11. If you haven’t done so yet, now is the time to add a dimmer on your dining room light switch. It is an easy DIY project. It will make all the difference when you are trying to set the mood for a holiday gathering around the table. SÖDER 7-arm chandelier. 12. Like modern and fun? Hang a STRÅLADecorative light – It looks like a big snow ball. Perfect for a kids party or table set with a modern vibe. It uses a LED light which consumes 80% less energy and last longer than incandescent lighting. 13. Decorative accessories always look more appealing when displayed in pairs or grouped together in odd numbers – 3 or 5. You can add instant glow and impact when lining STOCKHOLM candelabras along the table or placing a pair on a sideboard. They come in a stainless or white finish. 14. STRÅLA3 Star table lights have a small bulb in the center of the star. They will look perfectly festive lined up along the table while adding some whimsy, too. 15. SKIMMER silver glass candle holders add to the glow of the table when you light FENOMEN unscented block candles in gold, silver, red, or white on them. When a collection of them is grouped together on the center of of the table you have an instant centerpiece. Holiday dinners come in all shapes and sizes and so does the guest list that might be bigger than your table and seating will accommodate. 16. + 19. When the guest list gets bigger than the available seating NISSE folding chairs and HERMAN stacking chairs can come in handy. They can easily be stowed when not in use and are very easy to set up. They come in white, which coordinates with every table setting and occasion. If you want to add a pop of color to them, you can simply tie some festive ribbon around the back. Rekindle the romance of the season with soft shimmer and a sprinkling of sparkle. 21.+ 22. Make a grand impression by lining up a collection of glass vases as a centerpiece. Fill each with fresh flowers, greenery from your backyard, or a collection of colorful ornaments. For a more modern centerpiece, try floating a candle and some cranberries in a glass vase filled with water. REKTANGEL and BLADET vase. 23. Surprise your guests – serve them dessert on SNÖBAL festive patterned paper plates in gold and silver. 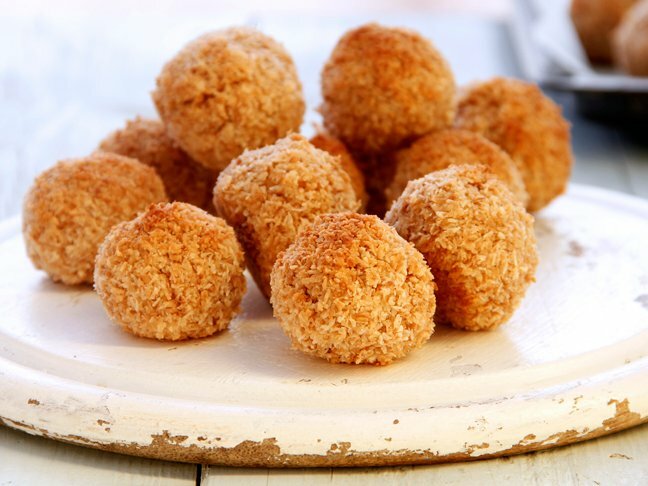 They look so pretty and the square shape will make a slice of pie look divine. 24. To keep things simple use SNÖBAL festive paper napkins in gold, silver, or red/white holiday designs. Don’t just simply fold these paper napkins in half and place under a fork. Fold them into a festive shape and place on the plate. You can find many different ideas by doing a napkin folding search online. 25. Create consistency by placing an ornament at each place setting. Write each guests name on the ornament with a metallic pen to create festive place cards. 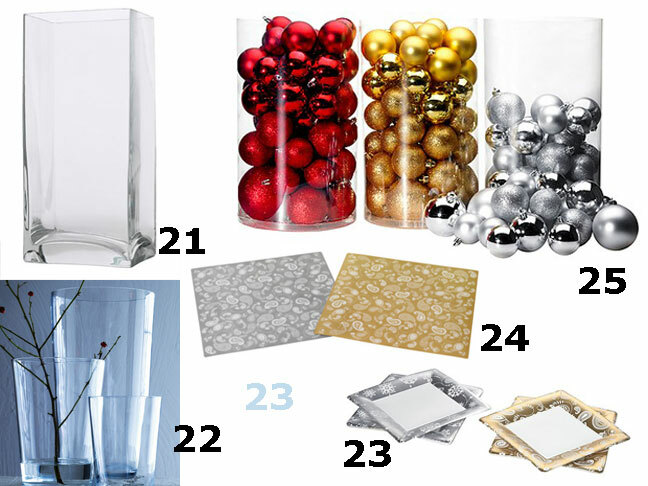 Shake things up a bit on the tabletop by placing a mix of red, gold, and silver balls down the center of the table. Another way to use the ornaments is to bring the chairs into the design of the table setting. This is easy to do by tying 1 to 3 ornaments onto ribbon. Make one to tie on the back of each chair. YRSNÖ set of 50 ornaments.